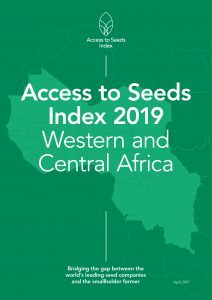 The Access to Seeds Index 2019 - Western and Central Africa is now available online. Nigeria-based Value Seeds tops the first Access to Seeds Index for Western and Central Africa, underscoring the potential of homegrown seed companies to reach smallholders in the region. By providing ‘value kits’ and training, the company improves accessibility and affordability of quality seed, particularly for next-generation and women farmers. 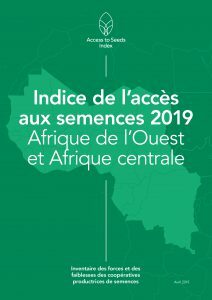 L'Indice de l’accès aux semences 2019 - Afrique de l’Ouest et Afrique centrale est maintenant disponible en ligne. La société nigériane Value Seeds est en tête du premier Indice de l’accès aux semences pour l’Afrique de l’Ouest et l’Afrique centrale, ce qui souligne que les entreprises semencières locales ont la capacité de toucher les petits exploitants de la région. Grâce à ses « kits complets » et aux formations qu’elle propose, la société améliore l’accessibilité aux semences de qualité sur le plan logistique et économique, notamment pour les jeunes exploitants et les femmes. 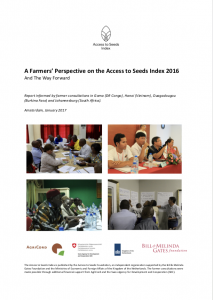 The Access to Seeds Index 2019 - Eastern and Southen Africa is available online. 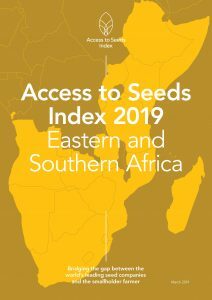 East African Seed tops the 2019 Access to Seeds Index for Eastern and Southern Africa. The company has a growing distribution network in the region. It stands out for its research activities that include local crops, seed production activities involving smallholders and a broad network of extension officers in multiple countries. 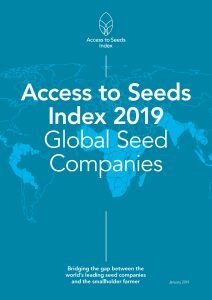 The Access to Seeds Index 2019 - Global Seed Companies is available online. Global seed companies combat climate change and nutrition needs, but reach only 10% of the world’s small farmers. Thailand-based East-West Seed leads global seed industry showing that shaping business models around the needs of small farmers can be profitable. The Access to Seeds Index 2019 - South and Southeast is available online. 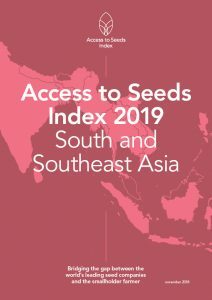 Thailand-based East-West Seed tops this first Access to Seeds Index for South and Southeast Asia. The company is built around a smallholder-centric business model, which is reflected in a client base made up almost entirely (98%) of smallholders. 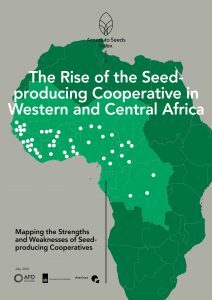 The rise of the seed-producing cooperatives in Western and Central Africa: A viable path towards improving access to quality seeds in the region. 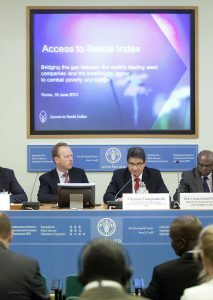 Summary of the Access to Seeds Index's side-event at the FAO Committee on Agriculture's 26th session. In the methodology for the 2019 Access to Seeds Index, more than 60 African, Asian and global seed companies will be evaluated on their efforts to support smallholder farmer productivity. 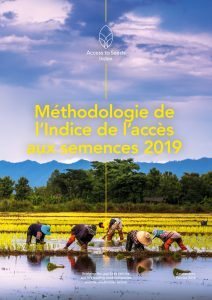 Dans le cadre de la méthodologie de l’édition 2019 de l’Indice de l’accès aux semences, l’analyse portera sur les efforts déployés par plus de 60 entreprises d’Afrique, d’Asie et du monde entier pour soutenir la productivité des petits exploitants agricoles. The landscaping study on the rise of the seed-producing cooperative in Western and Central Africa, evaluated over 50 seed-producing cooperatives across 20 countries. Strong performers were identified in four countries: Senegal, Mali, Burkina Faso and Niger. In eight other countries the situation was qualified as ‘promising’. The work was undertaken under the supervision of Mr. Yacouba Diallo, a regional consultant based in Bamako, Mali. L'étude sur l’essor des coopératives productrices de semences en Afrique de l'Ouest et en Afrique centrale a évalué plus de 50 coopératives semencières dans 20 pays. Des examples solides ont été identifiés dans quatre pays: le Sénégal, le Mali, le Burkina Faso et le Niger. Dans huit autres pays, la situation a été qualifiée de «prometteuse». Le travail a été entrepris sous la supervision de M. Yacouba Diallo, consultant régional basé à Bamako au Mali. 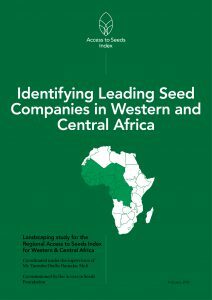 The Landscaping study for the Regional Access to Seeds Index for Western & Central Africa provides an overview of the outcomes of 20 country studies to identify leading seed companies in Western & Central Africa. Country specific profiles were developed by national focal points, who provided overviews of local seed sectors as well as a list of 22 leading seed companies in their respective countries. The work was undertaken under the supervision of Mr. Yacouba Diallo, a regional consultant based in Bamako, Mali. 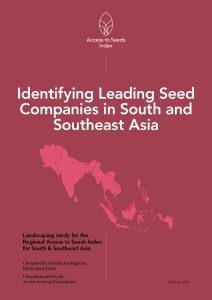 The Landscaping study for the Regional Access to Seeds Index for South & Southeast Asia provides an overview of the outcomes of 13 country studies to identify leading seed companies in South and Southeast Asia. Country specific profiles with an overview of the local seed sector as well as a list of the selected 24 leading seed companies are the result of a process of research, consultations and validation, which started with studies of the seed industry in 13 countries in the region by Mordor Intelligence, based in Hyderabad, India. 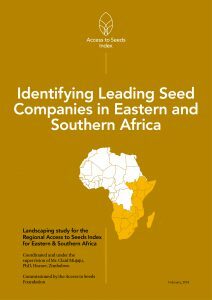 The Landscaping study for the Regional Access to Seeds Index for Eastern & Southern Africa provides an overview of the outcomes of 22 country studies to identify leading seed companies in Eastern and Southern Africa. 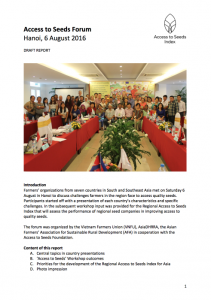 Country specific profiles were developed by national focal points, who provided overviews of local seed sectors as well as a list of 22 leading seed companies in their respective countries. The work was undertaken under the supervision of Mr. Claid Mujaju, PhD, a regional consultant based in Harare, Zimbabwe. 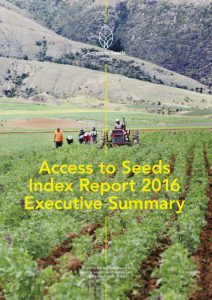 The 2016 Access to Seeds Index Report presents the rankings, key findings on industry level, good practices for all measurement areas and scorecards for individual companies. 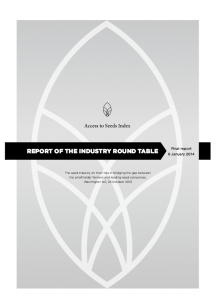 This executive summary provides a comprehensive 13-page overview of the key findings (1) for the three rankings, (2) at industry level, at (3) measurement area level for the Global Index and (4) measurement area level for the Regional Index. 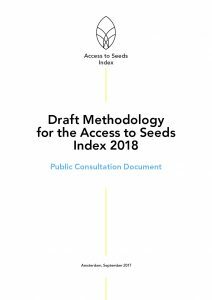 The public consultation period for the Draft Methodology of the 2018 Access to Seeds Index has ended. Thanks to those who contributed. The methodology will be launched in the beginning of 2018. La version préliminaire de la méthodologie est soumise à consultation publique. Les acteurs du secteur sont invités à envoyer leurs commentaires avant le 19 octobre 2017 à l’adresse info@accesstoseeds.org. 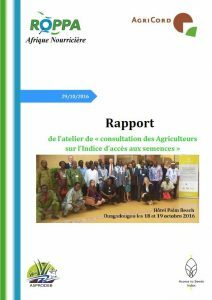 Report of four Farmers' Round Table Events in Goma (DR Congo), Hanoi (Vietnam), Ouagadougou (Burkina Faso) and Johannesburg (South Africa). L’objectif de l’atelier était d’échanger avec les OP ouest-africaines sur l’initiative Indice d’accès aux semences et d’engager la mobilisation de leur contribution au processus sur l’élaboration éventuelle d’un indice sousrégional pour l’Afrique de l’Ouest. 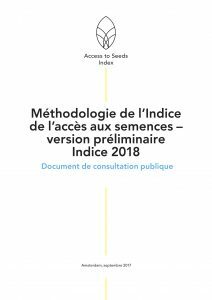 The 2016 Access to Seeds Index presents the rankings, key findings on industry level, good practices for all measurement areas and scorecards for individual companies. Ce résumé analytique offre une vue d’ensemble des principales constatations (1) pour les trois classements, (2) au niveau de l’industrie, à (3) au niveau des domaines de mesure de l’Indice mondial et (4) au niveau des domaines de mesure de l’Indice régional. El presente Resumen Ejecutivo ofrece una perspectiva general de las principales conclusiones (1) para las tres clasificaciones, (2) desde el punto de vista industrial, (3) a nivel de las áreas de medición del Índice Mundial, y (4) a nivel de las áreas de medición del Índice Regional. 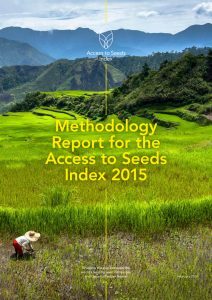 The Methodology Report for the 2016 Access to Seeds Index describes the methodology for both the Global Access to Seeds Index and the Regional Index for Eastern Africa. The methodology was developed based on extensive stakeholder consultations in 2013-2014. The draft was reviewed by an Expert Review Committee. 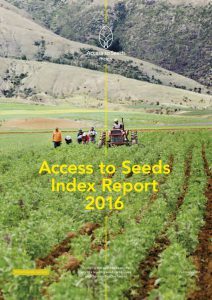 The first Access to Seeds Index was scheduled for publication at the end of 2015 but it was postponed to February 2016 to allow additional time for analysis. This report, prepared by Cardo Emerging Markets based in Nairobi, provides baseline information on the East African regional seed sector detailing both regional and country specific scenarios. The information has been sourced from existing literature and interviews with regional and national seed sector players. 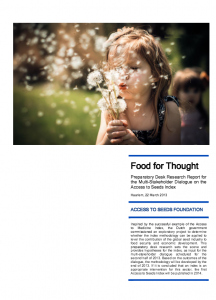 Twelve countries are included in this report: Burundi, Ethiopia, Kenya, Madagascar, Malawi, Mozambique, Rwanda, South Sudan, Tanzania, Uganda, Zambia and Zimbabwe. To develop the methodology for the Regional Access to Seeds Index for Eastern Africa, Nairobi based consultancy firm Cardno Emerging Markets was selected in August 2014. For landscaping purposes, Cardno set up a network of experts in the 12 countries that are in the scope of the Index, to consult stakeholders and to collect relevant data on the regional seed industry and farmers’ needs. 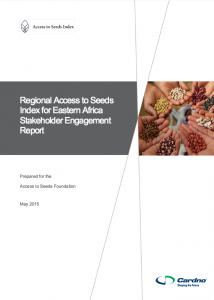 The Stakeholder Engagement Report, drafted by Cardno Emerging Markets, is a result of these consultations with seed companies, smallholder farmers and other stakeholders in the region. It contains an overview of their input on issues related to the role of the seed industry in availing quality seeds to smallholder farmers. 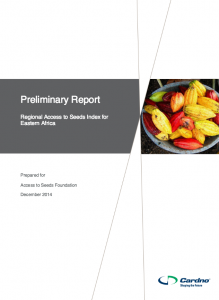 This data was used for shaping the methodology for the Regional Access to Seeds Index for Eastern Africa. Report of the Industry Round Table, Washington DC At October 23, 2013 the Access to Seeds Foundation organised a Round Table to consult the seed industry on the goals and methodology of the Access to Seeds Index. 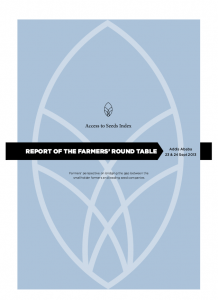 At September 23 and 24, 2013 the Access to Seeds Foundation organised a Round Table to consult farmers from Asia, Africa and Latin America on the goals and methodology of the Access to Seeds Index. Report of Access to Seeds Index side event at FAO Ministers’ conference At June 18, 2013 the Access to Seeds Foundation presented the outline of the initiative at the Ministers’ Conference in Rome. 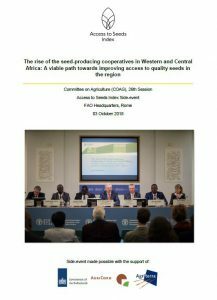 Based on extensive desk research, the Access to Seeds Foundation presented this report and its findings at April 5, 2013 at FAO. 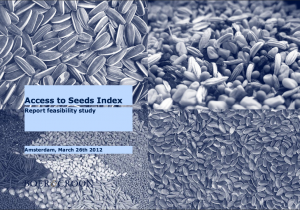 Beginning of 2012 the Access to Seeds Foundation conducted a study on the feasibility of the Access to Seeds Index. For this, 25 stakeholders were consulted. The study was conducted by consultancy agency BoerCroon.